September 15, 2014 bcalvanocoachingLeave a Comment on Weekly Angel Card Reading for September 15 through 21. Weekly Angel Card Reading for September 15 through 21. Here is a link to last Saturday’s show on BlogTalk Radio where I share this reading and speak about how the angels can assist us with the Law of Attraction. You can call in for a reading at 424-675-6837. 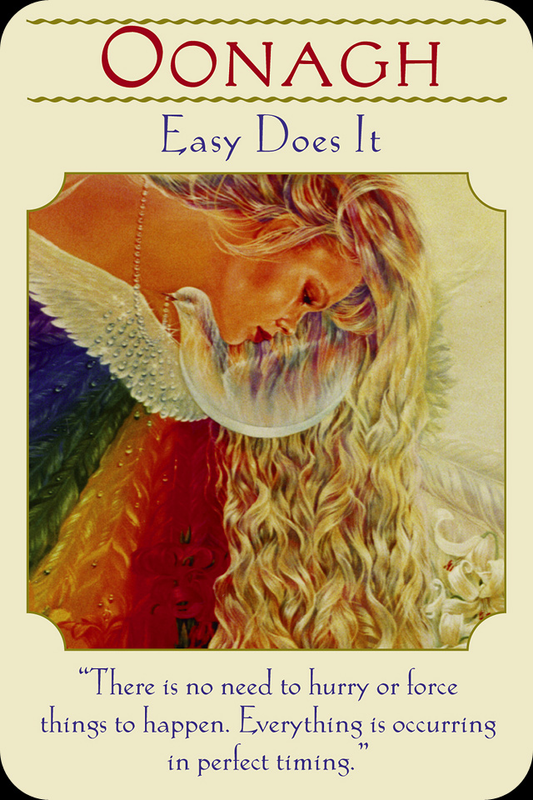 For Monday and Tuesday we have the message ‘Easy Does It” from the Celtic Goddess Oonagh. “There’s no need to hurry or force things to happen. Everything is occurring in perfect timing.” Relax, easy does it is a beautiful message about allowing. This includes all emotional states we may be experiencing right now. Allowing ourselves to be perfectly present to what is happening right now in our mind body and spirit. Without judgement or criticism, we can let go and be with whatever is happening and just breathe- the angels and God have our backs! Here Oonagh and the angels are letting us know that by trusting and having faith in our natural power we do not have to revert to forcing things to happen. Although we may have expectations about how and when things should happen at this time we should allow Divine timing to take place. Often it is the case that a far better and much more creative solution is in the mix from our angels. 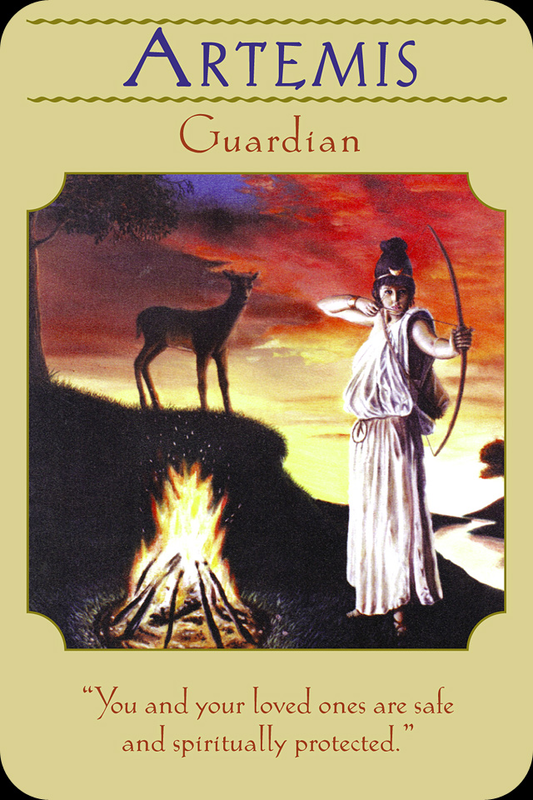 For Wednesday and Thursday we have the message, ‘Guardian’ from the Greek Goddess Artemis. “You and your loved ones are safe and spiritually protected.” This continues beautifully with the first message. All of our needs are being looked after. This include our finances, health and emotional needs. We are divinely protected and are reminded again that we can breathe and relax. Far more is experienced and enjoyed when we are at peace than in drama. This message can also include our loved ones who have crossed over that they are at peace too. Artemis reminds us to stay focused on our larger commitments and vison of life instead of being distracted by drama. The deer in the background tells us the being gentle with ourselves is key. Also, that our guardian angels are with us overseeing our protection and safety, supporting us with all our needs. The fire depicted on the card indicates our releasing that which no longer serves us. It also represents the loving warmth that is always with us from God and the angels. 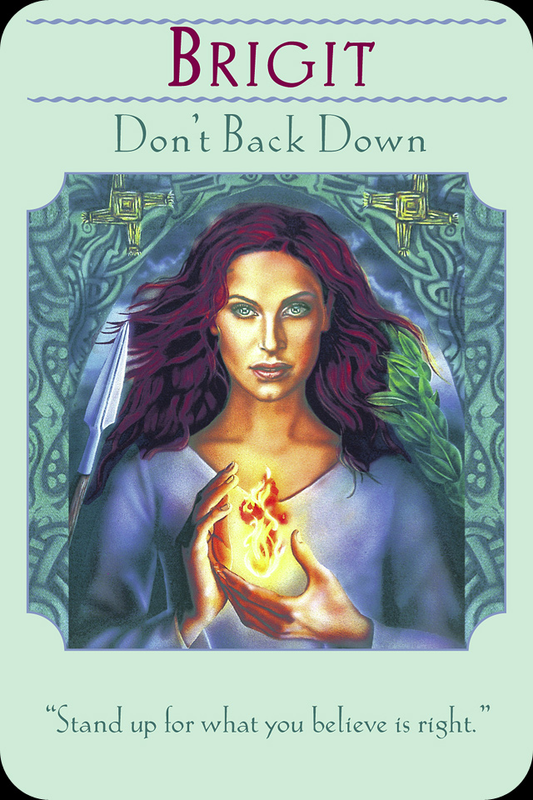 And for the end of week and weekend we have the message, ‘Don’t Back Down’ from the Celtic Goddess Brigit. “Stand up for what you believe is right.” Brigit is the feminine counterpart of Archangel Michael. She is a very powerful goddess that can assist us with courage, confidence, strength and the feminine power of intuition. Her message is to stand firm and resolute in your beliefs and commitments. Do not allow yourself to be swayed by fear, drama, obstacles or your ego. Her heart is filled with the flames of divine passion. She reminds us to allow ourselves to be filled with divine passion and love. Don’t back down from allowing your heart to be completely open and filled with the flames of love. Previous Weekly Angel Card Reading for September 8 through 14. Next Weekly Angel Card Reading for September 22 through 28.